A View From The Hook: On the Red Hook Radar - The Good, The Not So Good and The Ugly. 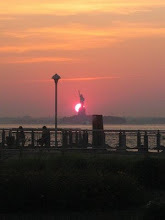 On the Red Hook Radar - The Good, The Not So Good and The Ugly. A number of development blips have flown into the Red Hook radar in recent weeks. Some good, some not so good, and some, unfortunately, ugly. Lets start with the good. There have been a couple of pieces of good news on the transportation front. First, the MTA looks as if its going to split the B61 bus into two routes (story from "The Word on Columbia Street" here) . The plan is to split the route into one from Red Hook to Jay Street, and another (to be called the B62) from Jay Street to Long Island City. I think all of us who ride the B61 on a regular basis will see this plan as having great potential to improve the reliability and punctuality of the B61 and to reduce pollution and congestion on our streets - i.e. more reliable public transportation = more ridership = less cars and pollution. The next piece of good news comes in the form of a feasibility study for trolley service in Brooklyn. Mayor Bloomberg said, at the announcement of this study (story here), "We'll look into the feasibility of using the city's old trolley tracks to create new streetcar service in growing waterfront neighborhoods in Queens and Brooklyn, starting in Red Hook." After the failure of Bob Diamond's initiative to bring streetcars back to Brooklyn and Red Hook in particular, this sounds like a positive development. Gary Buiso has more in the Brooklyn Courier (here). One of IKEA's many promises -- exchanged like chits for Red Hook's blessing for IKEA's rather large blue-and-yellow retail operation with its Red Rockers' "China" video flags flying out front -- was free transportation. More specifically, let us build, and you can ride our busses and ferry for free, as much as you want, whenever you want. It's a courtesy. "“We cannot continue [as a] commuter service for those who are not Ikea customers,” said manager Mike Baker in The Brooklyn Paper. Except for the part where you promised Red Hook you would. You let us in, we'll repay your kindness. Payment of kindness hereby withdrawn. The ligonberries are tasting a kinda bitter these days. This opens up the question of why we are relying on a corporation to provide the public transportation alternatives Red Hook needs and deserves? Especially when the service can be withdrawn, or made less attractive, with such ease. ... and the general thrust for more ferry transportation options in New York City, isn't it about time Red Hook received its own bona fide ferry service without having to be subjected to the uncertainty posed by the type of service IKEA has been providing up until now? 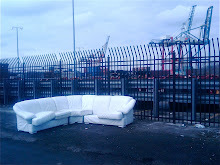 The IKEA service was never a legitimate commuter service, however it at least provided another option for Red Hook residents travelling within the limited hours that the service was operating. Now, with that service made less attractive to Red Hook commuters, and with the already established ferry dock sitting idle outside Fairway, wouldn't it make sense to see if some of those stimulus funds could be directed towards establishing a legitimate ferry service that services Red Hook? OK - now to the ugly. The recent announcement that Red Hook may be the new home to a cement plant came as a disappointment to me, and many in Red Hook, who again see the prospect of more trucks and pollution being jammed into out neighborhood. The location, for a start, seemed inappropriate - right across the street from Red Hook's Added Value organic community farm, as well as sporting fields (close to the Red Hook Pool), the Erie Basin Park and bike path, all on a site neighboring the IKEA store with its accompanying traffic. And again, as with the coming relocation of Phoenix Beverages to the Brooklyn Waterfront and the expansion of the Container Port, this project seems to be getting a free pass as far as environmental impact studies go. Mike McLaughlin's Brooklyn Papers article (here) quotes the Co-President of the Red Hook Civic Association. “It’s an awkward location that should have required more study,” said John McGettrick. I think John and Lillian make valid points, but I don't know what the impact of such a business would be on our neighborhood, environmentally or otherwise. Particularly, I'm not informed enough to know what the polluting effects of the dust and other activities related to these cement plants have on the the environment. But surely these issues should be investigated and the environmental impact created by the activities proposed on this particular site should be studied before the plant is given the go ahead - especially with such seemingly incompatible neighbors. One curious irony of this development is that, (I'm told), the previous use on this site was a cement plant, which was closed down after its violation of environmental laws. In that light it seems entirely appropriate for Red Hook residents to feel "once bitten, twice shy" on this matter. One last development - and I'll put this in the sad rather than ugly category - according to the Brooklyn paper, via Curbed (here) it seems as if Joe Sitt is in the process of knocking down the only remaining building on Red Hook's old Revere Sugar site. The 19th Century brick and stone structure was the only thing left standing after Sitt and his company, Thor Equities, demolished the iconic metal cone and other structures on the pier at Beard Street in 2006. Thor's contentious plan to build some kind of mall on the site have stalled recently, and a rendering of the proposal seemed to include the re-purposing of this structure, but apparently Sitt doesn't figure this building into his plans anymore. Whether the removal of the historic building means the site is easier for Sitt to sell, or easier to build on - for whatever he has planned for the site - he's not saying, according to Mike McLaughlan who is covering this story for the Brooklyn Papers. What is clear is that Red Hook is losing another iconic and historic structure - and that is sad. Regarding the structural integrity of the last vestige of the Revere Plant: How damaged can the structure be if they can hoist a front loader onto the top of each floor as they take it down? Since when has a building that can support a front loader been weak at the knees? Puhleez! His comments have absolutely no basis on fact. Every morning when I look at this happening I am completely outraged! Question: Does the blog author (or any reader) know of any event spaces that could accommodate 250 guests in Red Hook? Ideally I'm looking for a raw industrial space, but I'm pretty open. You can email me back at gypsyesquire68@yahoo.com Thanks!